PDF to Image Converter is a quick and easy-to-use batch PDF converting utility that is designed to convert PDF documents to image files. 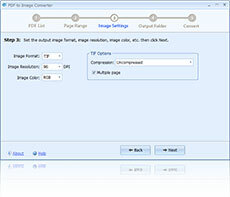 The output image can be JPG, TIF, GIF, PNG, JP2 (JPEG 2000), BMP and EMF formats. It is able to convert encrypted PDF documents and allows you to choose to convert all pages or specified pages. PDF to Image Converter is standalone software, Adobe Acrobat Reader is NOT required. PDF to Image Converter doesn't depend on any print driver so it will NOT install any print driver on your computer. Quickly converts PDF documents to image files. Supports many popular image formats. You may choose to convert all pages or specified pages. Converts PDF to vector format (EMF). 2. About 15 MB of disk space for installation.